Serving our Clients for 27 Years! Welcome to Alpha Financial Advisors, LLC. Alpha Financial Advisors was founded twenty-seven years ago by Eric D. Hess, CFP®, ChFC™ as a way to manage his family’s finances more effectively. The firm grew from the notion that other hard-working, successful people would appreciate honest and beneficial financial advice. That commitment continues today as protection for clients is apparent in every manner of our practice. Diligent analysis across all financial topics form the basis of a partnership centered on enhancing our clients’ financial lives. Alpha takes an uncompromised approach on behalf of every client. We are ideally sized to offer global services on a global scale while maintaining the ability to deliver the personal attention large firms often lose. As your advocate, we look out for you rather than you having to look out for us. 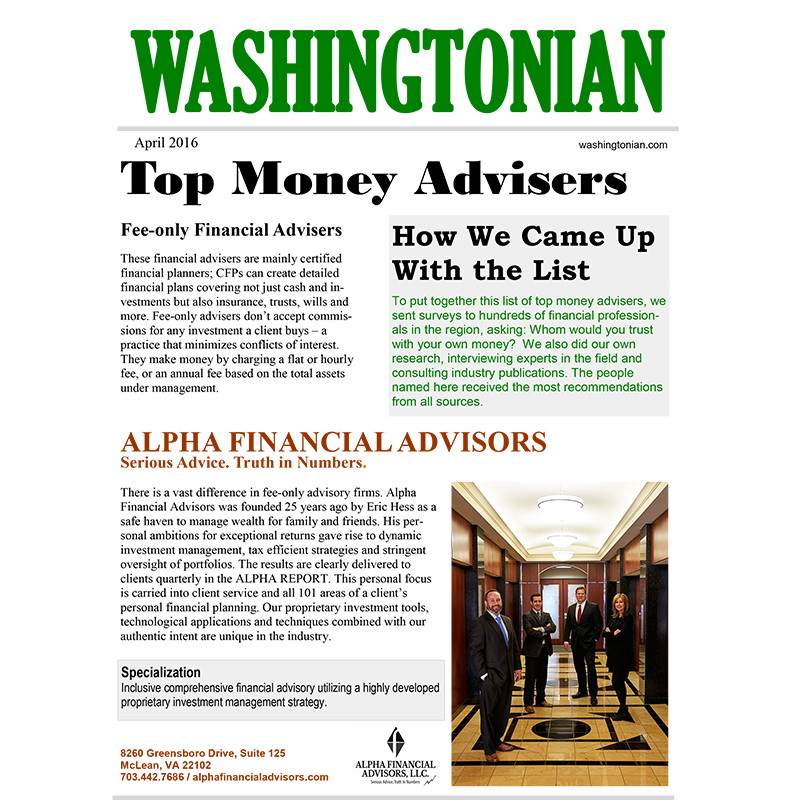 The simple model of commitment to values has made Alpha Financial Advisors one of the top ranked financial advisory firms in the Washington D.C. area.